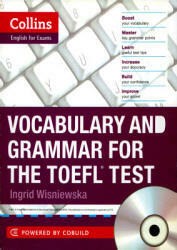 Vocabulary and Grammar for the TOEFL Test. Collins: 2013, - 192 p.
This book is intended as a preparatory tool for any student intending to take the TOEFL test. It provides an introduction to the vocabulary and grammar that are needed in all sections of the test. Why are vocabulary and grammar important to the test? Vocabulary: A good knowledge of general academic vocabulary is essential for all four sections of the test. The reading and listening sections both have specific vocabulary questions that check understanding of vocabulary in context. Rubrics for the speaking section include "effective use of vocabulary" and rubrics for the writing section include "appropriate word choice and idiomaticity. "The speaking and writing sections of the test also require you to read academic texts and paraphrase or summarize them in your own words. As well as knowledge of academic vocabulary, you will need to be able to figure out the meaning of unfamiliar words by using context and applying knowledge of word roots, suffixes, and prefixes. Grammar: Although the TOEFL iBT Test doesn't have specific grammar questions, knowledge of English sentence structure and ability to understand and use a range of grammatical structures is necessary for all sections of the test. For the speaking section, you should be able to speak confidently, without obvious grammatical errors that could distort meaning. According to the speaking section rubrics, the candidate should "demonstrate effective use of grammar" and "exhibit a high degree of automaticity, with good control of basic and complex structures." For the writing section, students should "display facility in the use of language, demonstrating syntactic variety and range of vocabulary." A good understanding of grammatical structures is also required to understand the passages and answer the questions in the reading and listening sections.